My in laws have a wonderful porch with rocking chairs and hanging baskets. It's a lovely place to sit and enjoy the outside. Two little momma birds have built nests in the hanging baskets. It's hard to tell in the photos just how little the nests are. I'd say they're about five inches across at most, so you can imagine how tiny the eggs are. I think the momma birds are little finches. I'm linking up with a few friday link ups. The theme at crazy days is critters. I figured my little eggs count as future critters, right? A lovely porch to sit and pass time on! 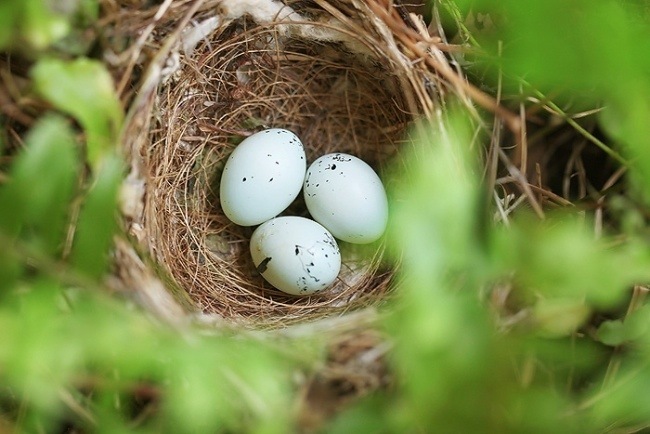 Those nests-with-eggs are gorgeous! Love porches!! Any shape. Any size. I'm a little surprised the mama bird lets you sit on the porch while she's watching over her 'critters!' :) Have a great weekend, Deb!! Gorgeous little eggs, and what a perfect place to sit and relax. Oh, to be sitting on a rocking chair in that porch. Looks like bliss!! And to have birds nests there too. Lovely. I have yet to get a great shot of baby birds in a nest, so make sure to do that for me- k? The egg shots are great. And I love that porch. I could sit out there all day on that. Thanks for joining Kristi and I for the Crazy Days of Summer! That porch is lovely. I haven't had any bird nests in my yard in over a year. We used to have a door thingie that they'd nest in but it took over our display so we took it down. I miss it. That porch is magnificent! wow! Lucky for you to find the nests - great photos! Love your egg shots!!! Maybe we get to see pictures of the baby birds when they hatch?? 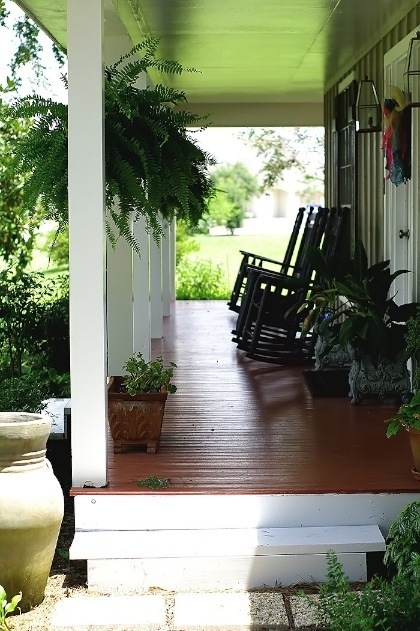 What a beautiful porch, such a restful looking scene. Great photos of those tiny nests too - I hope you get a chance to photograph the chicks when they hatch. What an inviting porch! And those nests are so lovely! Have a wonderful weekend! I could sit on that porch and drink maragita's for hours, lol! Can't wait to see if you capture the little critters when they hatch! Those nests are beautiful. Love them. Oh, I love those nest shots! So beautiful! I can't wait to see baby bird shots! ;) Great job! great shots of the bird nests and that porch ... well I'm there! What great shots of the eggs, that is so neat!! I am jealous!! What a delightful place & to find a nest - so perfect like that- it's just exciting! Lovely shot of that porch; it looks so peaceful! I must admit I like your critters a LOT more than some of the bug critters out there! I have serious porch envy!!! 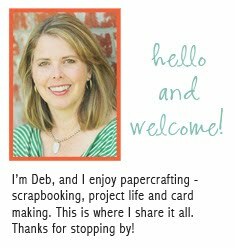 Great shots deb! Great composition on the nest pictures...I feel like I am peeking in on them! Great porch and a lovely little nest. Love it. So gorgeous. Love both those shots!! ...I need to stop looking at photography blogs. Feeling completely unaccomplished. Wow, those eggs are fantastic! It's incredible where the birds built their nests. The clutch of eggs are my favorite blue! I love their porch. Those nest are neat. You will have to take pictures of the birds after they hatch. We had a bird's nest on our front porch too. It's an incredible thing to watch them grow from eggs to baby birds. Love those nest shots - beautiful! 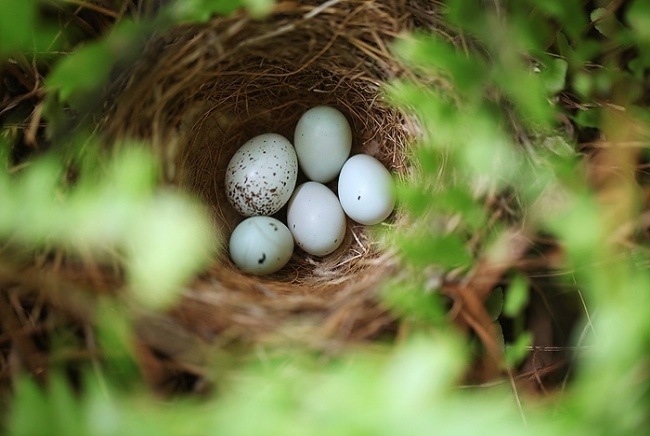 what sweet sweet images of the birds nests and those eggs....sigh!! so very lovely!! Nice captures!! I hope you can go back and take more of the babies when they hatch! !